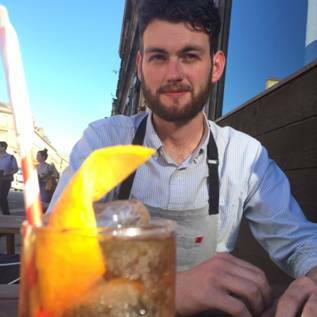 Danny Whelan, a rising star of Glasgow bartending, working at the Kelvingrove Café is the winner of the “Sprint to the Finish” cocktail competition and will receive tickets to a private box at the Commonwealth Games today when the 100m finals take place. In a closely contested competition Danny’s cocktail “Comerette Cooler” attracted the most ‘Likes’ on the Chairman’s Reserve Rum Facebook page possibly because his recipe was very well conceived, given the unusually hot and dry weather over the last few days. A delicious long drink made with Chairman’s Reserve Spiced Rum, served long with a side of ice cream, “Comerette Cooler”, attracted plenty of attention from the start and managed to hold onto the lead throughout the week. Add all ingredients except Root Beer to a mixing tin, shake and pour into a hi-ball glass over cracked ice. Float root beer over the top. Garnish with an Orange Twist, with Vanilla ice cream and Coconut Chocolate on the side. Runners up in the ‘Sprint to the Finish’ competition were Mike McGinty (Treacle, Edinburgh) and Matt Ronald (Blue Dog, Glasgow) crossing the line in what was almost a photo finish taking Silver and Bronze respectively. Mike McGinty having learnt his trade in Aberdeen moved to join the Edinburgh bar scene a couple of years ago and is now managing Treacle on Broughton Street in Edinburgh . Mike’s drink ‘Chairman’s Re-Served’ had a nice balance of simplicity and theatre, revisiting a classic rum serve. All put into a metal cup, with a lime cut into a square, covered in Demerara sugar, coffee, chocolate and cinnamon. A light on fire which caramelises the lime and it drips into the drink. Then extinguish the flame with 60 ml water. This is a twist on the perfect rum serve; coffee, lime and sugar, hence the name. Bronze medal winner, Matt Ronald, another Glasgow bartender, has been the manager at Blue Dog for a number of years and a fan of Chairman’s Reserve ever since he visited the distillery in St Lucia on a trip organised by Emporia Brands a few years ago. Also electing to make a drink based on Chairman’s Spiced, his cocktail was about balancing the different sweet, sour and spicy elements to make a refreshing summer serve. Ten contestants made it to the Chairman’s Reserve ‘Sprint to the Finish’ finals, all of whom are established UK bartenders or are rising stars in Scotland .